You can export eraser presets into an .xml file which will contain all of your eraser's settings. This can be useful if you wish to back up or share your eraser presets. Open the Brush Preset menu and select Export Brushes. The Export Tips and Textures dialog opens. 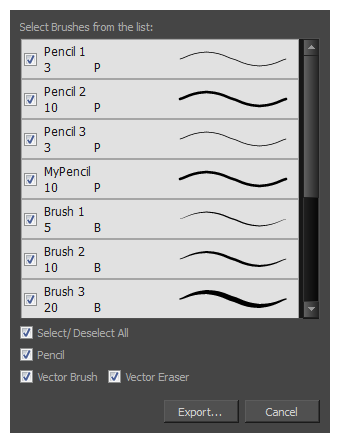 This dialog allows you to export brush presets for the Brush, Pencil and Eraser tools. By default, the presets for all your tools will be selected for export. If you only wish to export presets for specific tools, uncheck Select/Deselect All and select the tools for which you want to export the presets. In the Export Presets dialog that appears, browse to the location where you want to save the .xml file and enter its file name.